Fostering is full of joys and struggles. This is a far different experience than owning a pig, both physically and emotionally. Fostering is different than adopting. Fostering is the bridge between rescue and adoption. Without that bridge, many pigs would die. To foster is to care for a pig, to love, and to prepare for adoption. This isn’t to simply buy the pig time until adoption, but to nourish him and heal him from the harm that has been unfairly placed on him. Fostering is beauty like no other, and you will never truly understand the depth of the help it provides until you have cried tears as your first foster leaves your arms to a happily ever after. Often asked is “why foster when I can adopt?”. The answer isn’t easy. Sometimes, adoption is the perfect choice. Since you are here, we will assume you are interested in fostering, specifically. 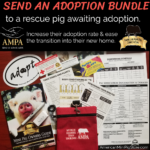 If you adopted every pig in need, your home would quickly overfill. This would limit the finances and dedicated time available to each of your animals. You would be spread thin quickly, with many more pigs waiting for a home in dire situations. Your hands would be tied, unable to help. This is where fostering is literally life saving. You save a pig. Bring her home. Prepare her for adoption. When the perfect match is found, she begins her new life. She will cherish her family but she will never forget the gift you gave her. The gift of life. The gift of love. The gift of family. Simply put: Adopting saves a life. Fostering saves countless lives. “I can’t foster because I wouldn’t be able to let them go”. This is easy. Give it a try. If you “foster fail” then you end up adopting your foster, you saved a life, you added a chosen pig to your family. Maybe it was meant to be. You found each other. It’s a win-win. More than likely, you will surprise yourself in your selfless dedication to helping homeless animals. When you learn all there is about this pig, and find the family that wants exactly what this pig has to offer, you will see what an impact you have made on the lives around you. That is priceless. That is better than “I’d want to keep them all”. Here begins the foster addiction. You’ll be seeking out the best homes for your beloved fosters. You’ll be proudly showing off your fosters for all to see. Your friends will drop their jaws at the progress you’ve made with your foster. You’ll create dramatic before/after photo collages of your foster. You’ll become Facebook friends with the adopted families, fondly watching the memories they create with their beloved pig. That homeless pig that you took in, with only horrid shelter photos, no history, no idea of what would show up at your house. You took a chance on that foster pig, now she sports reindeer hats at Christmas and feasts on watermelon birthday cakes, surrounded year round by a family who adores her. This life is only possible because you reached out an open hand when it was needed most. You were the bridge she needed. From discarded to cherished. Fostering pigs can be especially challenging as they are territorial animals, they bond closely with their owners and mourn terribly when they are displaced. Pigs are not as forgiving as dogs. Broken trust from previous humans takes a lot of patience and dedication to repair. Additionally, pigs have different body language and social structure than dogs. These differences may be confusing to many who are not familiar with the intricate relationships of pigs. Displacement is not easy on the pigs, either. The confusion and stress on them from being abandoned or rehomed is evident. It is easy for foster families to misinterpret this strain as a personal insult or failure. However, it is during this time that the pig needs you the most. To heal, to learn to trust, and to regain faith in their humans. The benefits of fostering are like no other. You have to feel it to believe it. However, fostering is hardly a walk in the park. You will miss your fosters terribly after adoption. It seems the only way to fill the void is to take in another dire foster. There’s always another. Another. Another. It’s draining, and exhausting. Vacations become scarce because your house is full, time limited, and budget stretched. Trips to he veterinarian. Again, again, again. New pig introductions. Again, again, again. Pigs mourning their family, pigs charging you, head swiping, attitude, testing the limits, defying the authority, breaking out of fencing, destroying household items, random health issues popping up. That frustrating part before the epic breakthrough. Then…. They’re adopted. You cry. You wonder if you made the right choice. What if she was the one that was meant to be? Now you will never know. Yet, she will always be there, in your heart. Adoption cannot take that away — she is yours forever. Fostering is often a roller coaster of emotions. It’s not for everyone, there is no doubt about that. The only way to know is to give it a try. Find a reputable and well established rescue organization you can trust. They will do thorough screening before placing a pig. This is important because it means they have the pig’s best interest at heart and will do whatever is necessary for her. You can count on them to find a good match for you. You can count on them to provide medications and microchip. You can count on them to pay veterinary bills. You can count on them to find and screen adoptive homes. You can count on them every step of the way. The rescue organization is more important than which individual animal you foster because the rescue will be there every step of the way guiding you and supporting you. That’s what it’s all about. Teamwork. For the pigs. Open your heart, open your home. Become a foster today.